The Three Amigos - Kapiti Playhouse Inc.
With a repertoire of up-tempo R’n’B from the 1940s and 50s, some classic jazz standards, some Mississippi Delta blues and the occasional western swing & jazz-oriented original song, the Amigos Trio features three of New Zealand’s most sought-after exponents of these genres. Separately, Andrew London, James Cameron and Neil Billington have taken their own groups to Jazz and Arts Festivals all over Australasia. Occasionally they pool their musical resources to offer a stage act with an eclectic repertoire and a high ‘entertainment’ component. Harmonica player Neil Billington is widely considered to be New Zealand’s finest exponent of both the traditional blues harp and the bigger chromatic instrument popularised by Larry Adler and Max Geldray in the 1960s, and elevated to serious ‘jazz’ consideration by Belgian Toots Thielemans. Kapiti’s James Cameron has led his popular ‘Velox Brothers’ trio since the early ’90s, holding residency at Wellington’s Parkroyal Hotel throughout that decade. 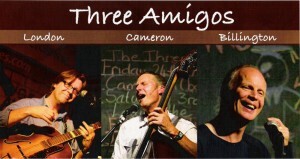 Cameron and London are both founder members of Kapiti five-piece country band The Cattlestops, who featured in local movie ‘Second Hand Wedding’. Kapiti guitarist Andrew London has taken his Hot Club Sandwich trio as far afield as Saudi Arabia to perform his quirky satirical swing-flavoured original songs. Both Billington and Cameron have contributed to Hot Club Sandwich gigs and recordings in the past, so this collaboration goes back almost 20 years.